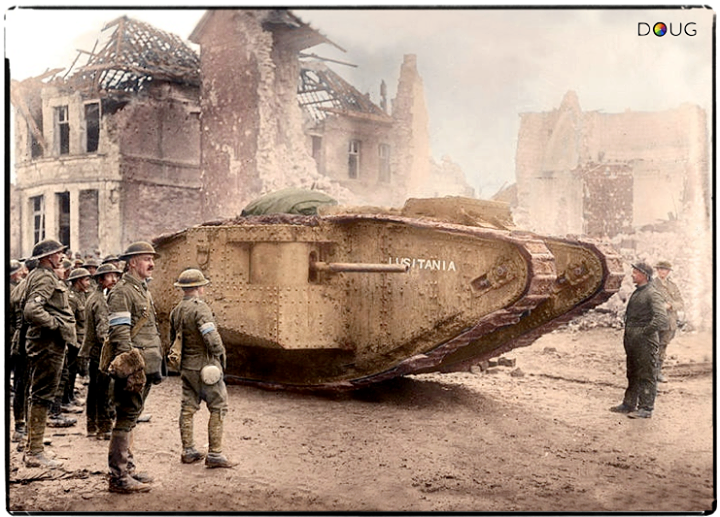 The British Mk.II (Male) tank Nº.C-47 ‘Lusitania’ of 9 Co. ‘C’ Battalion at Arras, Nord-Pas-de-Calais. April 1917. On April 9th the ‘Lusitania’ assisted stalled troops at Railway Triangle east of Arras, enabling that objective to be taken. The Lusitania broke down with a magneto failure, and had to be left on the battlefield, where she was destroyed by British gunfire the following day. 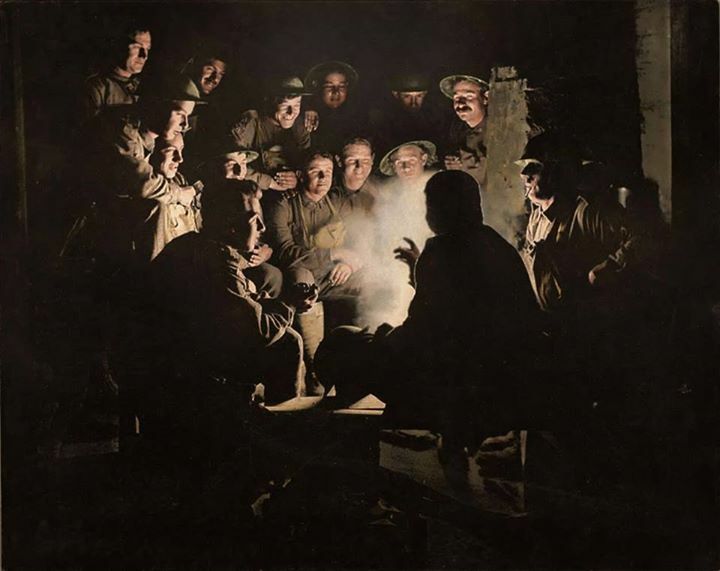 Lieutenant Rupert Frederick Arding Downes MC addressing his Platoon from B Company, 29th Battalion, during a rest near the villages of Warfusee and Lamotte before the advance onto Harbonnieres, the battalion’s second objective. The background is obscured by the smoke of heavy shellfire. of South Melbourne, Vic, later transferred to the 32nd Battalion; Pte Hall, an iron moulder of South Melbourne, Vic, an original member of B company, was wounded in action twice. Lieutenant Downes MC of Camden, NSW, was an orchardist prior to enlistment, sailed as a second lieutenant and was promoted to lieutenant in May 1917. He was awarded the Military Cross for “conspicuous gallantry and devotion to duty” at Morlancourt in July 1918 and like most of his men was transferred to the 32nd Battalion with the reorganisation of battalions which took place in 1918. 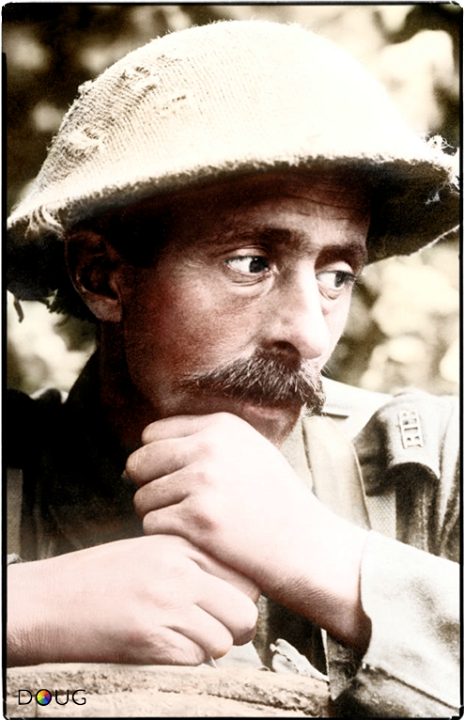 A soldier of the Royal Irish Rifles captured by the Germans during the Ludendorff Offensive (Operation Michael) of March/April 1918. 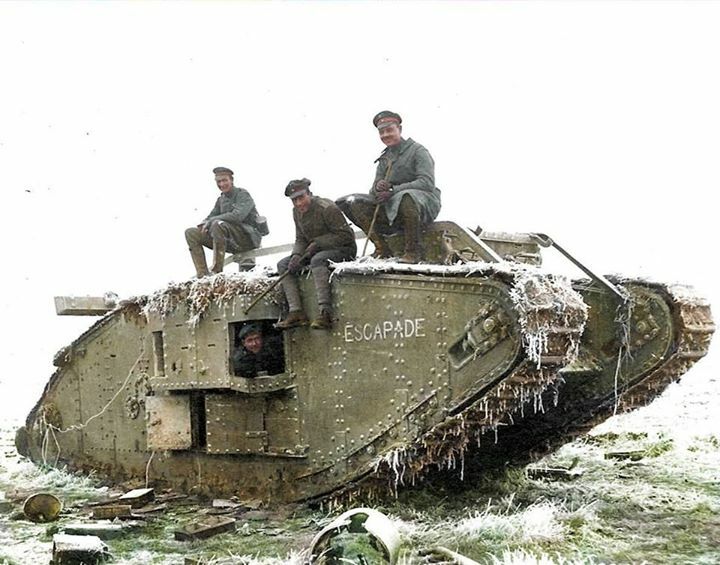 The attack, began after a five-hour 6,000-gun artillery bombardment as 65 divisions from the German 2nd, 17th and 18th Armies attacked the British 3rd and 5th Armies along a 60-mile front in the Somme on 21 March, it met with dazzling early successes – particularly to the west and south-west of St Quentin, where the German 18th Army made immense and unexpected progress against formations of the British Fifth Army. Slower progress was made in the centre and in the north where obstinate British resistance threw the main offensive off-course. 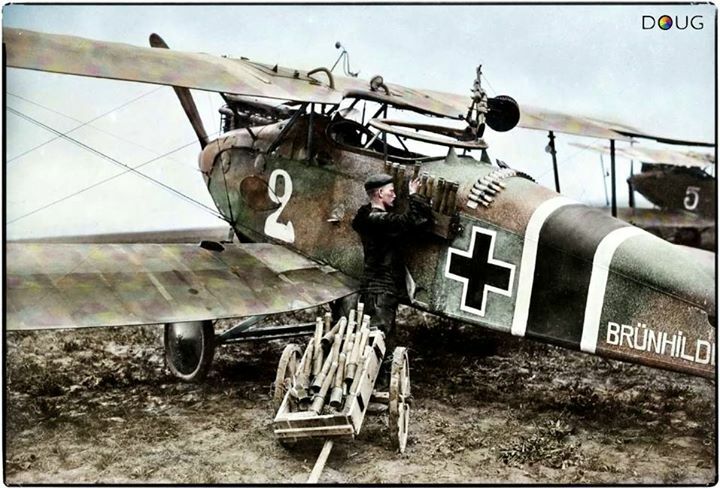 Pragmatic and opportunistic readjustments to original objectives and the major rebuff dealt the Germans at Arras on 28 March reduced and redirected the offensive towards the secondary goal of Amiens – with a view to splitting of the British and French armies. But crucial allied defensive actions around Villers-Bretonneux denied the Germans even of this prize and the ‘Great Battle in France’ was called off in favour of new attempts at decisive breakthrough in Flanders. A Canadian soldier wounded in his shoulder and leg, drinking hot coffee at a soup kitchen 100 yards from the German lines at Hill 70. 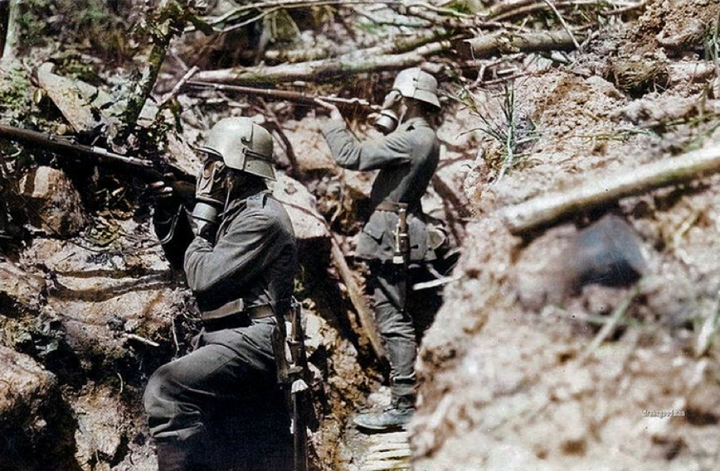 The Battle of Hill 70 was a localized battle of World War I between the Canadian Corps and five divisions of the German Sixth Army. 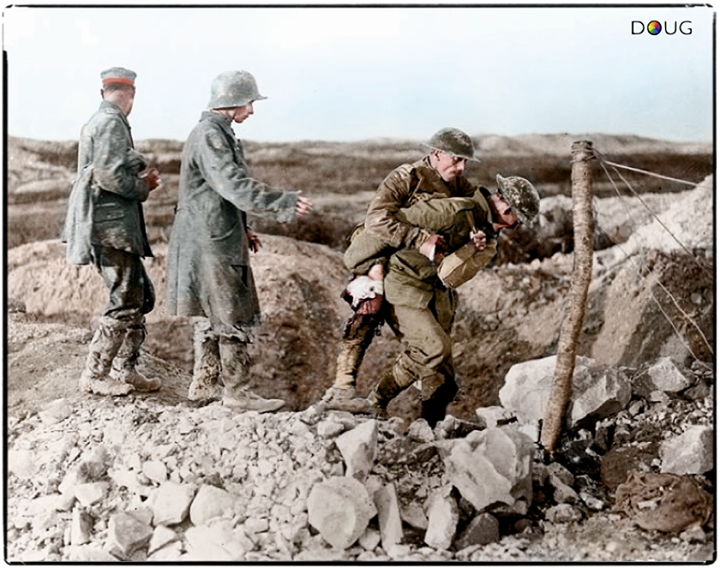 The battle took place along the Western Front on the outskirts of Lens in the Nord-Pas-de-Calais region of France between 15 August 1917 and 25 August 1917. 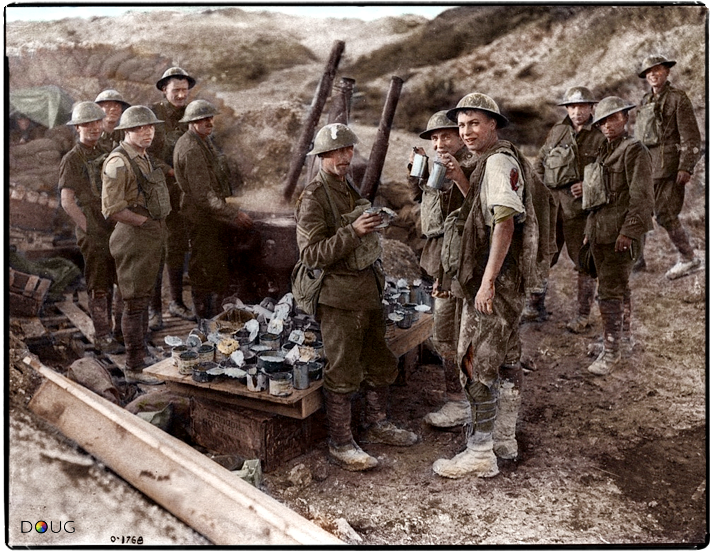 Canadian soldiers and German POWs at the Battle of Hill 70, north of Lens in the Nord-Pas-de-Calais region of France between 15 August 1917 and 25 August 1917. 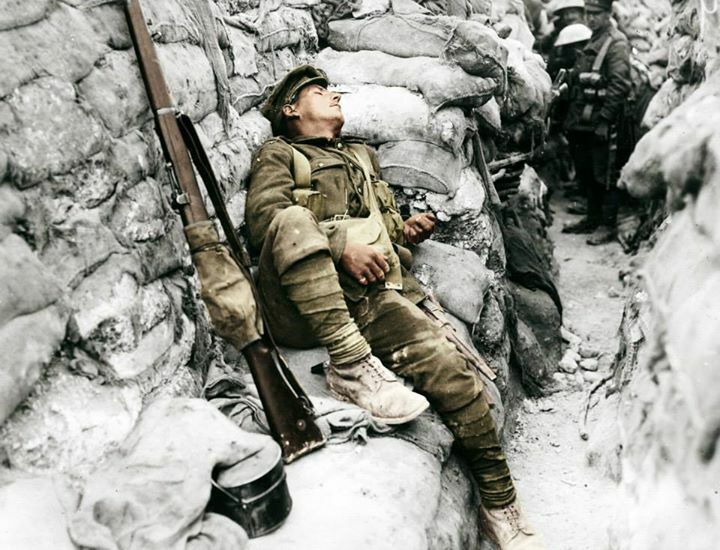 An exhausted British soldier asleep in a front line trench at Thiepval, Somme. September 1916. 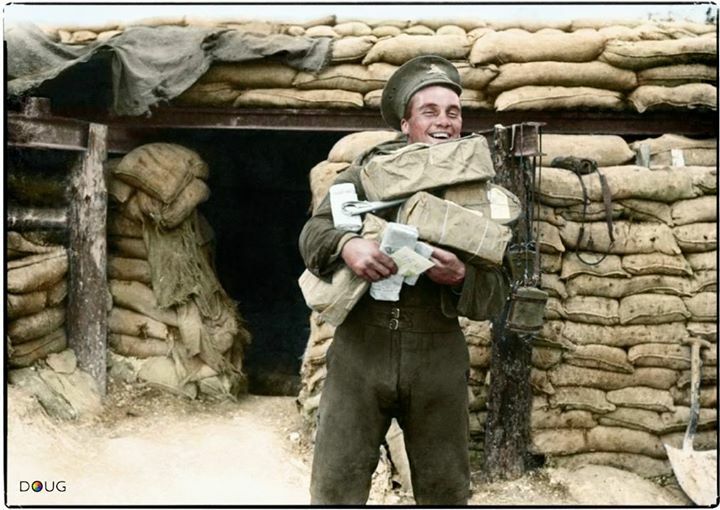 A smiling artilleryman with the post for his battery, near Aveluy on the Somme, September 1916.
https://www.facebook.com/pages/Colourized-pictures-of-the-world-wars-and-other-periods-in-time/182158581977012 The Battle of Pilckem Ridge: Crossing the Yser Canal at Boesinghe, 31st July 1917. 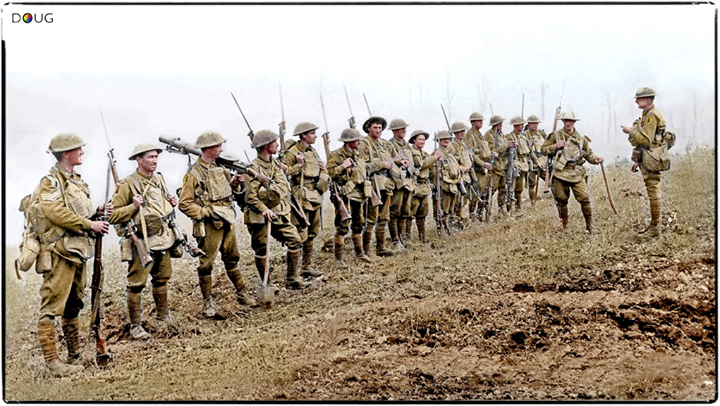 The offensive began on 31 July 1917, but made disappointingly small gains. 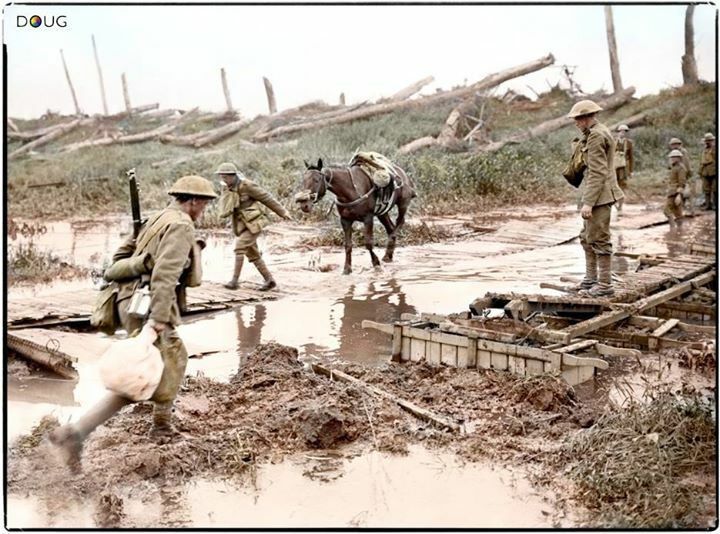 The British artillery bombardment, which was needed to shatter the enemy’s defensive trench system, also wrecked the low-lying region’s drainage system, and unusually heavy rainy weather turned the ground into a wasteland of mud and water-filled craters. 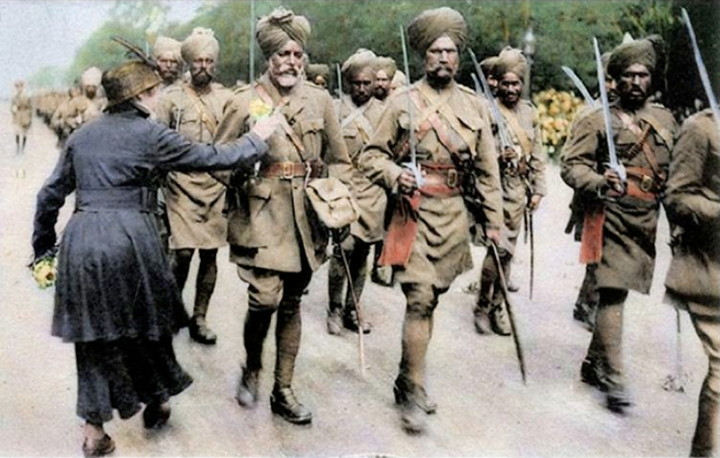 For three months, British troops suffered heavy casualties for limited gains. 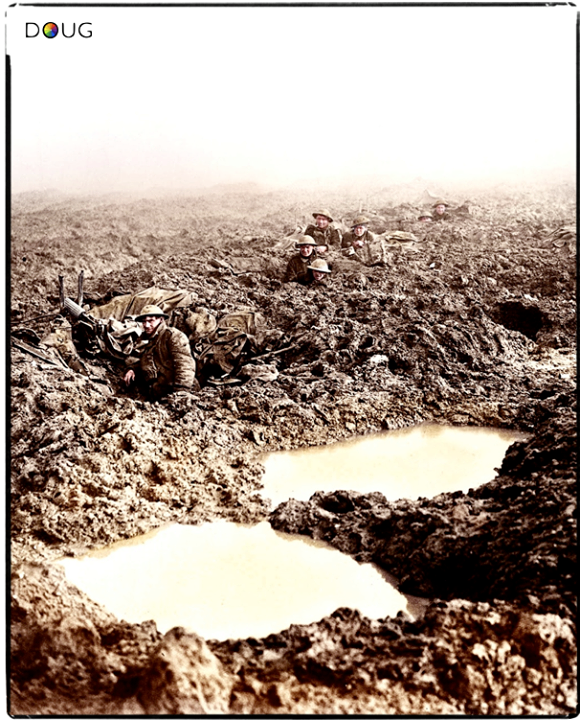 Personnel of the 16th Canadian Machine Gun Company holding the line in shell holes during the Second Battle of Passchendaele, November 1917. 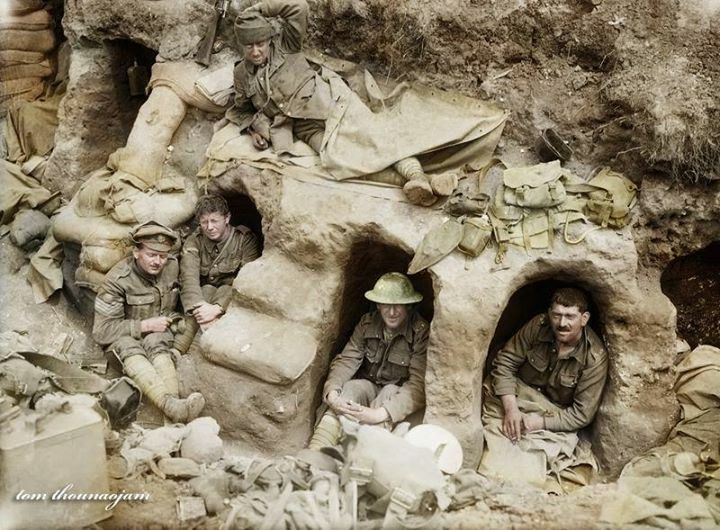 The machine-gunner closest to the camera, on the left, is Private Reginald Le Brun (790913), he was the only survivor from this photograph.